Looking for a sweet way to show your gratitude? 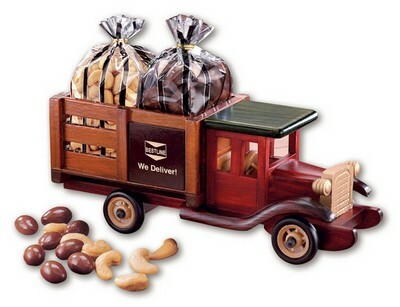 You've found the ultimate reward with a Classic 1925 Stake Truck with Cashews & Chocolate Almonds. Dimensions: 10" x 4" x 3 1/2"
Price includes imprint foil-stamped in gold on both sides of Stake Truck. Recipients will appreciate the style and craftsmanship of our version of a classic 1925 stake truck almost as much as they’ll appreciate the cargo! Both sides of the truck feature your imprint foil-stamped in gold and packed with chocolate covered almonds, six-ounces and jumbo cashews, five-ounces. Because each truck is handmade, we cannot guarantee that all trucks will be identical. Truck is imported. Minimum number of items in each order: 18 items.